At some point in the past I was posting 6 days a week and had a nice theme going for each day. Then the summer happened. Now I’m trying to recover a bit and start my regular posting again. I could go back and see what Friday is all about but I decided that I’d rather start something new. I have claimed to be a geek, even using it in my name, but I spend so little time showing off my geek. Ok sure the Fellowship of the Travelling Smarty Pants crew knows of my geek-fu as I have handled many fixes for them, but it is time to let the geek make regular appearances. In that vein I will be trying to highlight some specific piece of geekdom each and every Friday. Instead of picking a specific gadget or software today I think it would be great to point to one of the best sources of geekitude on the internet, Think Geek. This website has some of the best geek apparel and gadgets. I have a few items and a wish list a mile long. Some of the offerings can be enjoyed by anyone regardless of their geek-belt degree, but many of the items couldn’t be understood without fairly advanced geek-fu. 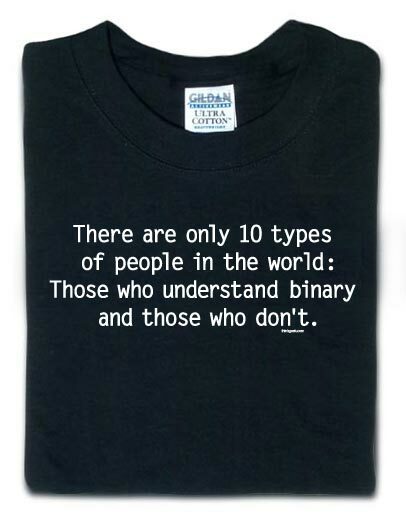 A great example is a shirt I love which reads “There are 10 kinds of people in the world, those that understand binary and those that don’t.” Now if you have a sufficient geekabulary then you will get the shirt. If you are my mother-in-law you will laugh because you think you get it, but the joke is not, “only 10 people in the world understand binary.” Since I am in the category that understands binary I get the shirt and I also get the binary clock that is sitting on my entertainment center. I hope you will find this merchant of geekery as enjoyable as I do. Dude -I can't believe you didn't link the website. How un-geeky! I totally did link the website but I think I need to alter my CSS to make links a bit more apparent. How dare you challenge my geekpremacy. @katdish,There I've changed the linky color so you can find it more easily. That clock is 01100011 01101111 01101111 01101100! @katdishI might try to fix that, but I'm not having any trouble … might be time for bifocals? @katdish,There my site is not bifocal friendly. Much better…and I don't wear bifocals.Yet. 01001100 01001111 01001100Indeed it is!